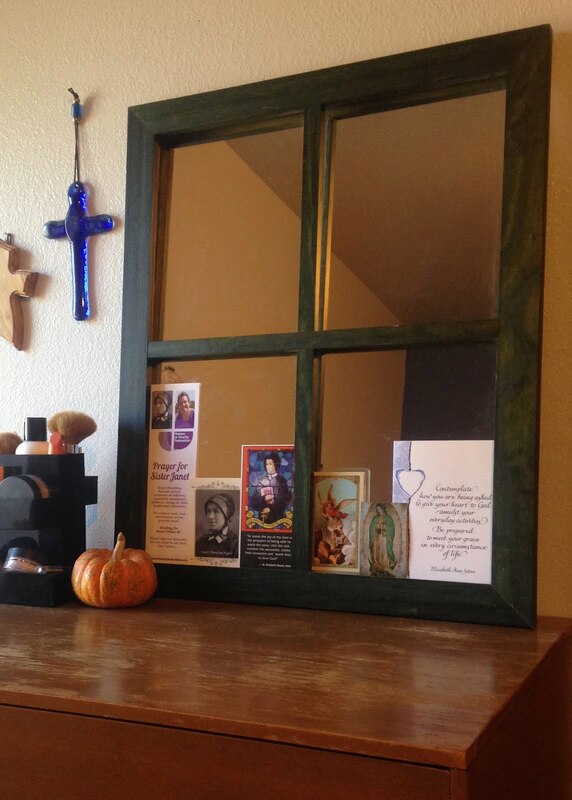 One morning while rushing to get dressed for a busy day, I peered at my mirror and became frustrated by the array of prayer cards and saintly portraits obstructing my reflection. Although my initial reaction was to push the hindrances out of the way, I suddenly realized that the mirror was a perfect metaphor for my transition into religious life and the Lenten season. Living in community with five other women along the U.S.-Mexico border has certainly had its challenges, but it has helped me grow into a more humble, compassionate, and faithful person. When I found my reflection behind the other faces in my mirror, I pondered the many people who have influenced my path to religious life. From the friends and family who have encouraged my discernment to the saints whose lives have inspired me in deepening my relationship with God, I have never been alone in my journey; and in that moment, I gave thanks for the mysterious ways in which the Holy Spirit has been present throughout my life. As I visualized those people from my past and present—individuals who have helped me in some way—I also imagined the unknown people whom I may someday be able to help. Looking back at me in the mirror was a young woman who puts the needs of others before her own wants and needs. She was a woman who understands that God lives in the interactions we have with one another and in the love we share with the world. She was a woman unafraid and unselfish. She was the woman I hope I am brave enough to be. With Lent beginning, I continue to reflect on the ways in which I am growing into a more loving disciple of Christ. Much like my addition of inspirational images and messages on my mirror, I intend to add to my daily routine instead of focusing on the traditional Lenten practice of subtraction. I am going to spend more time in prayer, more time in nature, more time getting to know the people around me, and more time living in the moment with a joyful, loving heart. As my formation in religious life progresses and new challenges and frustrations arise, I look forward to the ways in which I will continue to grow and reflect on God’s graces in my life.